You can now purchase Tile Tips all at once rather than waiting over six months for them! Just scroll down below the form and get it all now! Since the first three on the list are highly unlikely to change or help you I’d like to concentrate on the last – Tile Tips. Since you’re reading this I’m assuming one of two things: either you are interested in learning about tile or you enjoy really bad humor. You’re in luck! I making both available in one little handy email format. Just sign up below with your name and email and whenever I sober up about twice a week you will receive a handy little tip, trick, or secret about tile installation. I’ll wrap these little tidbits up in really bad humor and shoot them right to your email so you can start your day off with either a chuckle and a helpful tip or one more person to hate. 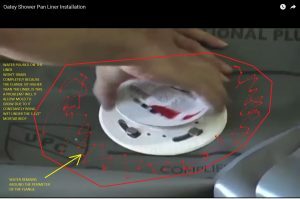 These things help speed up your installation, make the installation easier and less stressful and help put professional touches on all the little things you may overlook. Things like how to eliminate grout haze, how to get dead-level and flat walls and how to eliminate hollow spots beneath your tile. I also include all the really important stuff that drives me absolutely insane(r) like how to keep your 5 gallon buckets from sticking together and how not to electrocute yourself with a drill while using your hole saw. Fun for the whole family! So how much is all this delicious jackassery? It’s free. ‘Cause I’m just super-cool like that. Unless you want to buy them in the form of an ebook, if so just scroll down below the form. These will only be sent out once – not recycled like spam (the unwanted email – not the delicious breakfast pseudo-meat) so get yours now before I sober up long enough take enough time off work to make an ebook out of them and actually start charging people for stuff. Which I will do. Seriously. Get it now while it’s free. 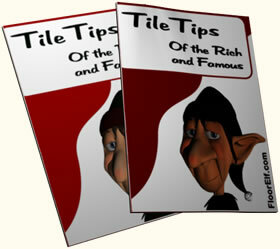 If you would prefer to simply purchase an ebook with 50 tile tips in it you’re in luck! You can do that now. Rather than waiting over six months for all this useless information you can now purchase all this useless information at once! You can receive an immediate download link for a 90 page ebook in pdf format with 50 Tile Tips in it. You can get the same tips free, but they will be delivered to your email over the course of 6 months. You can get all these tips for free – however, for every TileTips ebook purchased I will donate a portion of the sale to Homes For Our Troops! How do I access your response to my previous questions? I’ve forgotten your advise already (too many adult beverages). I’m in need of your opinion since I have a lot of contradicting ones and not sure which “professional” is right. I recently purchased a house and I’m remodeling the bathrooms and laundry room. The house is built with 2×10 joist 16″ OC with I believe 5/8″ OSB t&g subfloor (.609″ is what it’s stamped). It has a green coating under the areas that seem to have moisture which are the areas I’m redoing. I’m concerned with the deflection would like to know what I need to do to have a good acceptable installation without raising the floor too high. Right now the main focus is a small 3′ x 7′ bathroom. Not sure if it makes a difference but the joist are running parallel with the 3′ wall and the 7′ wall starts at 4′ away from the support beam below. It has a basement but the one side (3′) is where the garage connects to the house so directly supported. In my head the room is more stable than a larger room with no walls holding the joist stable or one a lot further from the supports (which are 14′ apart). I’m installing 12×24 (Carrera) marble tiles. There was engineered wood flooring glued down which I pulled and used a spider blade on a Sawzaw which worked great. Didn’t even need to get out my heat gun. I need to fill a few minor gouges but hoping I’ll be fine with thin set filling them between the next layer. I believe I’ll want to utilize Ditra XL. I’m assuming you may suggest putting thin set approved for OSB/adhesive, screwing 3/4″ ply, thin set, Ditra, thin set, tile, unsanded grout but I would love if I could get away with the Ditra without beefing it up. I’m planning on having very small grout lines 1/16″. What ever you suggest it would be extremely helpful if you just let me know what type of thin set you would use at each stage you’ll save me a ton of research. Also should I seal the tile before grouting (after setting?). 411 impregnator or aqua seal gold sound decent if so? The other rooms ~6×8′ each are tiled and its rock solid and no cracking. It doesn’t even shake when jumping up and down so I would have to believe there’s a sufficient way using the subfloor I have (at least with ceramic/porcelain – which I am using 6×36″ in a bathroom upstairs). With these rooms being larger and not having adhesive, would your suggestions be different at all for support or products used? Your joist structure determines your deflection ratio, nothing you put on top is going to significantly change that. The good news is your deflection ratio is over 380, which means your floors are in good shape for your installation. If you use Ditra XL you do not need to add another layer of ply, a single layer is fine. Over OSB I use laticrete 253 Gold and Laticrete 317 between the tile and ditra. I normally will seal marble before grouting, 511 impregnator is what i normally use. Aqua seal gold also works well. You should be able to use that installation in all your rooms (provided the structure is the same). Thank you for the fast reply, I’m trying to get this done before Thanksgiving so you saved me a lot of time. According to Ditra they recommend a 1/4” x 1/4” notched trowel between the ply and membrane. I have to look at what the manufacture recommends for the membrane to tile. I believe I read in your post 3/16” since marble is fairly consistent but I have to double check. The only thing left now is for me to buy your tips book and read through it. One or two tips is worth what you ask for it, hell you answer was worth about 4x+ that. Honestly I spent hours looking and called about 9 home improvement stores just trying to get someone that sounded like they knew a little without luck. If it weren’t for you I would need to put in a step in front of my room to get up onto the 4 layers of 3/4” ply everyone seems to recommend. Thanks again! 1.) Ditra XL is nearly impossible for me to get soon, since I don’t need waterproofing abilities what about SpectraMat? Would the thinset you recommend be different if so (modified – suggestions?)? 2.) It seems like the 253 gold is a special order. They said they just carry a Bostik? product that works the same (can’t remember the number). Do you think this will be okay or should I drive to the store that’s 45 miles away vs. 10 got get the 253? I realize the previous question may make this irrelevant. 3.) I was planning on using the SpectraLock epoxy grout you recommend. I wanted to go with a 1/32 grout line if possible but it’s only rated for 1/16 from what I’m told. They said the power part C probably wouldn’t even let it go into 1/32. So is the powder fine enough that I can get it in a 1/32 and also not abrasive enough that I have to worry about it scratching the marble or should I just go with a 1/16″ grout line or different grout? 4.) Lastly, if you still feel like putting up with me the trowel notch sizes recommended? Thanks again and if I come to Colorado I owe you a few beers! Ok sorry for the multiple post. I’m hoping this may save some of your time not answering all my questions. I was able to get the 253 gold and 317. Check! I found your trial notch size explanation and will go with a 1/4” square or 1/4”, 1/4”, 3/8” depending on how I’m feeling and what’s available and make it work. Check! Now to the questions, I’m trying to tile today so if you see this it would be greatly appreciated if you let me know your input so I can proceed (and not check my email every 20 minutes looking for an email from an elf….really). Ok I’ll leave the jokes to you. The membrane. I can get regular Ditra or Ditra heat mats. I’m not big in the mats but don’t know why think the small pieces but I’m on here typing what do I know. I heard they are comparable to xl. So do you think I’m fine going 2 miles away to the big box store and getting Ditra or should I try to get Ditra heat that will cost more and require some driving or the one last possibility is one store said they may have some xl for $3/sq ft but they need to wait until Monday to even see. I know I should probably wait for them and just pay the extra but again trying to tile today and they didn’t seem that confident they had it. Next question is the grout. I love the idea of epoxy and never worrying about it. I’m not big on the idea of having scratched tile with epoxy. Thinking if I use masking tape around the grout lines and it don’t push hard I should be okay but what’s your opinion? I bought not sanded perma color because they are out of spectralock but having second thoughts. Thinking I will wish I used epoxy a little down the road when my grout is stained but if the marble needs sealed and that’s kept up on it may be fine. Opinion please? There are alternatives to epoxy for stain-resistance. My go-to is currently permacolor select by laticrete. You can get that in unsanded. You can also do an acrylic (pre-mixed) like Mapei flexcolor CQ or TEC InColor. There have been massive advance in acrylic pre-mixed technology in the last ten years. It’s actually good stuff now. Sorry it was autocorrect “on” not “in”. I was saying that I’m not big on the mats. In other words something about them I don’t like, probably the idea of the mats being a lot of separate pieces vs one piece across the whole floor. Thanks for the input. I’ll hold off until tomorrow to see if I can get XL. I heard that the xl and Ditra heat have the same supporting properties. That they are the same thickness and they are both approved for osb with 24” oc joist and natural stone. I didn’t verify that it’s just what the one guy that I can get it from said. Ill probably just stick with the perma color for the grout if that’s the case. Thanks again for the fast reply and have a Happy Thanksgiving! They do have the same properties (xl and heat). Happy Thanksgiving to you too! If it’s natural stone then yes, if it’s a porcelain or ceramic, no. You will grind through the very thin glaze and expose the tile body, which never matches. I’m stumped on a solid solution for a shower tile install for a customer of mine. Customer chose 1.7” x 7.75” subway tile (all single tile). My issue is the first course possibly not having enough surface to bond to as the 1/2” CBU protrudes 1/4” beyond the shower base, which leaves a 1/4” gap behind the tile to the flange. Not usually a problem with any normal size tile, But this tile is only 1.75” (height) which would only give me about 1” of bonded tile to the CBU… the other 3/4” would floating in the wind. Any suggestions on how to solidify the first course in this situation? Realistically half of the tile being bonded around a tub like that will be fine. You can fill that gap with a feather finish patch (concrete-based) first, then bond your tile. The feather finish would not bond to the acrylic, but once installed it will be bonded to the back of the tile and will fill in that empty space. I’ve been installing tile for years, and I used to always end up with flat floors. But lately, I install the floor and it is level when I leave for the day. But, When I come back the next day, it is no longer level. Dude, what am I doing wrong? Have they changed the thinset formula? It gets me so pissed!!!!!!! Love the humor!!!!!! When in this line of work, I always need something something to make me smile and laugh. When tiles are not laying flat, it is generally foul language coming out of my mouth. And then another 12 pack. It could be a number of reasons. Tiles keep getting bigger, I’m sure you’re aware of that. With the larger tile we need to use a medium-bed more often (currently known as LFT mortar – large format tile). It just has more sand in it, this prevents it from shrinking as much as it cures. That is normally the biggest issue. It can be flat as hell when set, then it cures and shrinks unevenly, pulling tiles all over the place as it does so. Thinset has changed, but not significantly so. It’s more an issue of the tile. I have a 4″ wide half height wall next to the entrance to my shower. My bull nose tile is only 3″ wide. Is it ok to rip tiles to 2″ wide and run a grout line down the center of the 4″ width. Seamless glass will me installed on top of it and to the entrance edge. Me again! Sorry, I have a dog my wife cares for very much and I don’t want him to burst into flames because I made a mistake doing this bathroom! It’d be bad. Nope, not really. Can if you want, but not necessary. My shower pan is a pre-formed custom size with bench made by Ange Tile-EZ. They recommend using Mapai’s Ultra Flex 2 thin-set for the tiles. I cannot find this in my area. Is there another thin-set that would compare to Ultra Flex 2? The Ditra-Set you recommended for Kerdi-Board is great. Much easier to handle than the All Set. Thank you. Negative hydrostatic pressure. The pressure of the water behind the wall is always exactly that – pressure. It will always win when pulled down by gravity against a force that is not under pressure (the inside of the shower). Also, if the shower is properly waterproofed – as it should be – you can take a hose and place it right up to that hole, turn the water on full blast and water will STILL not get into your wall cavity. To ‘pour’ through a hole that size there would have to be absolutely nothing on the other side of it, space for the water to go. That doesn’t exist. If you don’t want to do it, don’t do it. But it works and it’s necessary. Laticrete 253 or 254, Tec 3-n-1 are comparable. Versabond would likely be just fine as well. Thank you for all of your past advise and tips. I am about to start tiling shower walls built with Kerdi-Board. I’m using Ditra-Set. I previous tiled a tub surround built with Kerdi-Board, but used Schluter’s All Set. I had issues with the thin-set not wanting to stay on the board as I applied it. I don’t want to have the same issues using the Ditra-Set. Does moistening the surface of the Kerdi-Board help eliminate this issue? Are there any other tips you could suggest trying. I mixed the thin-set according to instructions on bag. Also tried more and less water in the mix. The ditra-set is a bit ‘stickier’ than the all-set, but not much. I mix it a little loose (a bit more water), but that’s about the best you can do. Wetting the surface does not help, but burning it into the kerdi-board (force a layer of thinset into the board with the flat side of the trowel, like backbuttering a tile) before spreading it helps a lot. Thank you. I read your advise on backbuttering the other day. Have one question. How thick or thin is the layer of thin-set you spread apply to the tile? Seems to me it should just be a thin layer. Just enough to fill the pattern and voids on the back of tile. Correct? I used 12 x 24 tiles on floor and tub surround. I backbuttered all of those tile. But used 1/2 x 1/2 notch to help reduce lift. Shower is 12 x 12 tile and I don’t want as much thin-set behind the tiles on the shower walls. Yes, it’s just a layer thick enough to fill everything on the back of the tile. I would just like to thank you so much for indirectly helping me with waterproofing and installing tile in my bathroom (two) walls and floors. Without your insight and guidance, I do not think I would have been able to do as good of a job. It may not be 100% perfect, but my experience with installing tile has only been with these two bathrooms. I have the deepest appreciate and respect for you. Once again, thank you! Have read quite a bit on your site as I am in the midst of redoing our bathroom. I have removed the old tile and and gotten down to the cement subfloor. I have 12 x 24 porcelain floor tiles that I will lay with a 1/8″ grout line after reading your advice. My question is that throughout the main floor, which is mostly original floor tile in our 15 yr old house, there are a great many cracks and some run quite a length. We have cement floor on all levels with in floor radiant heating. My assumption is that these cracks are from not laying the tiles right over the in-floor heating system at the right temperature. Is that correct? Do you have any advice before I start as to whether the heat should be turned up so that the expansion is at its most or if the floor should be cool to allow for contraction. Perhaps the wrong thinset was used (modified vs non-modified)? All i know is that the crack are too numerous and I do not want the same happening when I lay my new tile. Any advise is appreciated. The reason you mention is but one of several things that it could be. Your best bet is to use a membrane like ditra which will separate the tile from any micro-movement in the slab, such as expansion and contraction due to the radiant heating. You want the heat off when you set the floor, and for a minimum of 14 days afterward. As far as the highest temperature, if you use a proper membrane you’ll not affect the tile no matter how high you crank it up. Thanks for all the information and guidance you provide on your website and discussions. I’ve been slowly raising the master bath in my 90 year old house from the dead. I am at the point of setting the mud over the vinyl liner that was installed by a plumber 2 years ago. I had to pull the liner corners and reinstall them properly because the plumber did an incorrect installation. I am now concerned that the plumber installed the preslope incorrectly. The plumber also installed a foam pre-slope under the vinyl liner. The drain assembly and its marriage to the liner are definitely watertight. Very grateful for that. I do have one concern though. When I pour water onto the liner and allow it to drain, the water doesn’t drain completely. The flange of the drain assembly sits atop the liner so that I get a solid 3” wide perimeter of water pooled around the flange. Is that normal? It makes me think that any water which seeps under my 1 ½” mud bed will just sit there forever and create a situation where mold / mildew will grow. Do I need to pull up the liner and raise up the pre-slope so the flange will be lower? It actually is normal. It will drain through the weep holes. If you look closely around the perimeter of the flange there should be little spaces shaped like rectangles on the bottom. Those are the weep holes. I’ll check to see if the weep holes are clogged. I’ve done quite a bit of carpentry and all of the drywall / sanding etc. since the installation of the liner and drain system. I tried to keep all that debris out of the shower tray, but maybe I didn’t do such a perfect job. Maybe those weep holes are just clogged? tiles in a 3.5 X 6.0 foot shower. The wall orientation of the tiles is “portrait”, not “landscape”. We are at loggerheads as to the orientation of those same tiles on the ceiling. If we line up the grout lines with the back wall, they don’t match the side walls, and vis-a-versa. Visually, would it work to cut the 12 X 24 tiles to 12 X 12 ? Which orientation would you suggest? Thank you. 12×12 will work, but I prefer to have the orientation the same as the back wall. So it would be oriented from the front to back. You can line up all the grout lines on the back wall and every other grout line on the side walls if you have consistent grout lines. It’s likely not enough coverage in those areas. Not a big enough trowel, mortar too dry, etc. Remove one of those tiles and see if there is any mortar on the back of it. If not your problem will likely be solved simply by replacing them with a larger trowel and properly mixed mortar. After reading your info I am planning on building a shower with the topical barrier method with a liquid membrane. Is this also suitable for waterproofing the floor ,together with the tape? I am also in the process of lowering my subfloor and would like to keep the height of the showerfloor as low as possible. What is the minimal thickness of deckmud at the drain? With the floor out it would be relatively easy to just preslope the subfloor to a linear drain. Would I make it easier on myself if I did that? I know next to nothing about tile and I’m hoping you can give me some advice. Our bathroom shower was professionally renovated approx. 3 yrs. ago with porcelain tiles. I’m not thrilled with the variation in the width of the grout lines around the base of the shower. In some areas it’s normal and in many other areas the wall tile is almost butted up against the floor tiles with almost no grout line, which I’m guessing would have made it difficult to get grout into thoroughly in the first place. With foundation shifts, the grout has crumbled at the base of the shower and I can see that water is seeping in there and not drying. I realize that adding grout on top of the existing likely wouldn’t be a good solution. Can you tell me if there is anything besides re-grouting that needs to happen, or anything else we should be considering? Thank you in advance. That is a change of plane (between the wall tiles and the floor), it needs to be siliconed rather than grouted.